Angelo d'Arrigo died tragically on Sunday 26 March 2006. Crazy? Can this be possible? Two people thought it was perfectly possible, and did it on May 24 2004. 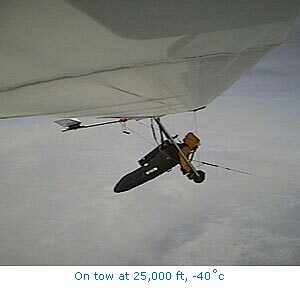 Despite some very marginal weather conditions and some last minute technical glitches the hang glider was towed to a point very close to the summit. 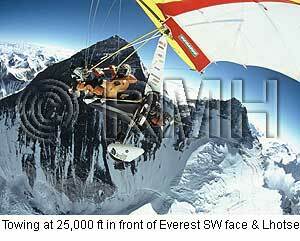 The microlight pilot exchanged waves with a group of climbers who were standing on the summit as he flew over Everest! British Microlight pilot Richard Meredith-Hardy and Italian hang-glider pilot Angelo D’Arrigo started preparing for this project in 2002. It was a highly technical exercise requiring the development of a lot of specialist equipment to cope with the extreme conditions. Very high takeoffs, (12,200 ft), temperatures of minus 25° C at altitudes where without oxygen the normal ‘time of useful consciousness’ is less than one minute. A great deal of equipment testing was done in the year preceding the flight including cold tests in the FIAT environmental wind tunnel, hypobaric tests with the Italian Air Force and flight tests to great altitude. 20 April Complete team assembled in Kathmandu. 20-30 April Established base camp at Lukla and advanced base camp at Syangboche. May 16 First unsuccesful attempt. 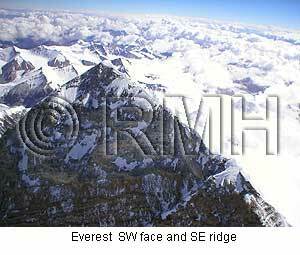 May 24 Successful flight over Everest. June 1 Returned to Europe. A special Microlight tug was prepared for the job, consisting of the renown UK built Pegasus Quantum trike equipped with a Turbo-intercooled Rotax 914 engine and a Pegasus XL wing. The Hang-glider was a state of the art Stratos from Italian manufacturer ICARO 2000. The hang glider was towed behind the microlight on a 65 metre rope fitted with various safety devices which allow it to be released in the case of emergency or malfunction. Both pilots were wearing military style pure oxygen breathing systems and a 'get you down' backup system and very effective 'The North Face' all-in-one suits against the extreme cold. The microlight pilot also has an electrically heated inner suit powered by the engine. Detailed meteorological research of the Everest region indicated that it may well have been be possible to soar in ‘blue thermals’ to 9,000 metres or more over Everest in the spring season. Richard Meredith-Hardy was World Microlight Champion in 1990. He has also been World Cup, European and British champion. He flew a microlight from London to Cape-town in 1985/6 and has been involved in many other flights in strange places. He was awarded the Royal Aero Club’s Gold medal in 2002. He lives in England 50 Km north of London. Angelo D’Arrigo has been flying hang-gliders for more than 20 years. Angelo flew the central Mediterranean migratory route from Tozeur, central Tunisia to Catania, Sicily in 2001. (Richard was tow pilot). In association with a Russian university Angelo recently accompanied a flock of endangered Siberian Cranes in a Hang glider equipped with a ‘Mosquito’ power unit 5,500 Km from the Arctic circle in Siberia, across Kazakhstan to the shores of the Caspian sea in Iran. He lives in Sicily near Catania. "The first question which you will ask and which I must try to answer is this, What is the use of climbing Mount Everest? and my answer must at once be, It is no use. There is not the slightest prospect of any gain whatsoever. Oh, we may learn a little about the behaviour of the human body at high altitudes, and possibly medical men may turn our observation to some account for the purposes of aviation. But otherwise nothing will come of it. We shall not bring back a single bit of gold or silver, not a gem, nor any coal or iron. We shall not find a single foot of earth that can be planted with crops to raise food. It's no use. So, if you cannot understand that there is something in man which responds to the challenge of this mountain and goes out to meet it, that the struggle is the struggle of life itself upward and forever upward, then you won't see why we go. What we get from this adventure is just sheer joy. And joy is, after all, the end of life. We do not live to eat and make money. We eat and make money to be able to enjoy life. That is what life means and what life is for."